What takes eight hours to solder and uses more shrink tubing that you thought imaginable? An LED matrix installed in a real pumpkin. When I mentioned that we’d like the LED pumpkin in last Friday’s post scaled up to a full LED matrix I had no idea it would be me doing the work. But [Caleb] and I thought it might be just the thing to present for the hacker’s favorite holiday. Installed in the autumn vegetable is a marquee made from a 5×14 matrix of light emitting diodes. I spaced them by printing out a grid on the computer, taping it to the pumpkin, and drilling 70 holes in the front of the thing. The real trouble came when inserting all of the LEDs from the inside; each of them has four wires soldered to it, creating a net of black wiring. Above you can see it turned out great. This is a shot of it scrolling the message HAPPY HALLOWEEN. Join us after the break for video of this prop. But we’re not just sharing the finished product. I’ll take you through the build process. Along the way you’ll learn the design considerations that go into an LED matrix and how you can use these techniques to build your own in any size and configuration you desire. [Ben Heck] is in the Halloween spirit with his Portal inspired “see through” t-shirt. That is, a thin lcd is mounted on [Ben’s] chest, with a not as thin camera mounted on his back; when the system is running, everything behind him is captured by the camera and displayed on the LCD. The concept isn’t exactly new by any means, often by the name of “gaping holes” or “hole through body” or more, but the project goes to show that a creative costume isn’t always the most elaborate, expensive, or even a new idea. 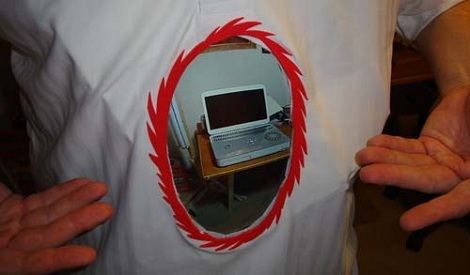 Catch a video of how to make your own Portal shirt, after the jump. Oh, and you can win the Portal shirt here. Picking up a raw egg is not something we’d think a robot gripper would be good at. But this model uses a bulbous tip instead of claw, which makes crushing the object less of a concern. That tip is kind of like a balloon. It is stretched full with coffee grounds but air can also be pumped in and sucked out. When it comes time to grip an object, a bit of air is pumped in and the bulb is pressed down on its target. Once in place all of the air is sucked out, locking the coffee grounds around the object. Take a look after the break to see just how many things can be gripped with this technique. Now the real question, can it bring me a beer? It looks like the iPhone lock screen provides just a marginal level of protection. [Jordand321] discovered a key combination that opens the contact app on a locked iPhone. Just tap the emergency call button, enter the pound sign three times (###), then tap call and immediately tap the lock key on the top of the phone. If this is confusing just look at the video after the break to see how it’s done. You don’t get access to everything on the device. But this does give an attacker access to all of your contact data and allows that person to make any calls they desire. If you ever wanted to incorporate tank treads into one of your build you should check out this guide. The method shown above is our favorite, which uses rubber fuel line hose and #10 machine bolts to hold together two lengths of hollow-pin roller chain. 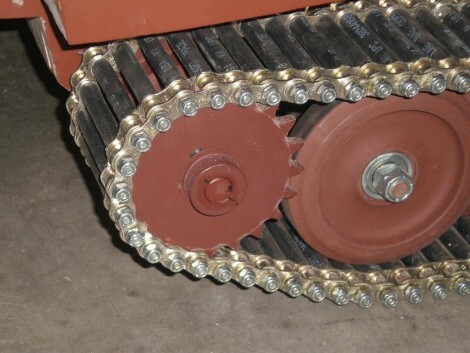 You can see the drive sprocket is keyed into the outer length of chain but the wheels that distribute the vehicle’s weight rest on the rubber tubing. You’ll also find details on building hinged track, molded track, plastic conveyor track, treadmill track, and bicycle chain construction. This should cut down on development time when you finally get around to making that paintball tank. Wanting to save space and weight on his project build [Florin] set out to find a way to add Ethernet connectivity without the magnetics. His ill-advised first try involved directly coupling two switches, frying both in the process. After some research he found that Ethernet hardware manufacturers have considered the need for devices without the magnetics and there are several application notes available on the subject. 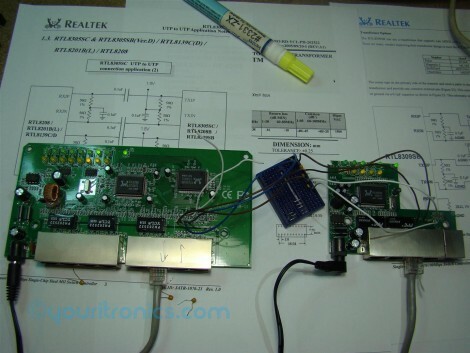 [Florin] followed the information that Realtek has for their devices and learned that they can be couple capacitively. After depopulating the magnetics from a second pair of switches he wired up some resistor-capacitor networks on a breadboard and got the connecting to work. The above is a specially designed game controller made by [Giorgos] solely for the RTS game Men Of War (now that’s dedication to a game). [Giorgos] started off with a rough breadboard and 11 buttons. Slowly overtime he included a joystick, countdown timers, and the wonderfully lit case. Under the hood is a couple of PIC microcontrollers multiplexing the switches, LEDs, timers, and also interfacing with the computer via how is it not dead yet PS/2 port. The build log is a very detailed read and well worth it, even if you’re not planning on making a custom controller. [Ben Heck] better watch out, there is a new controller making enthusiast on the loose.